Join us on February 21st for our Post Secondary Information Night run in collaboration with TOPP Soccer. At the information night Ciara McCormack will provide our parents with valuable information in the recruitment process as well as some exciting software Calgary Blizzard players will be able to use to assist this process. Ciara McCormack, TOPP Founder, Yale and University of Connecticut graduate, and the first female Canadian player to be a part of a Champions League Final in her time with professional club Fortuna Hjorring, will be presenting to motivated Blizzard players interested in playing at the university level on February 21, 2019. 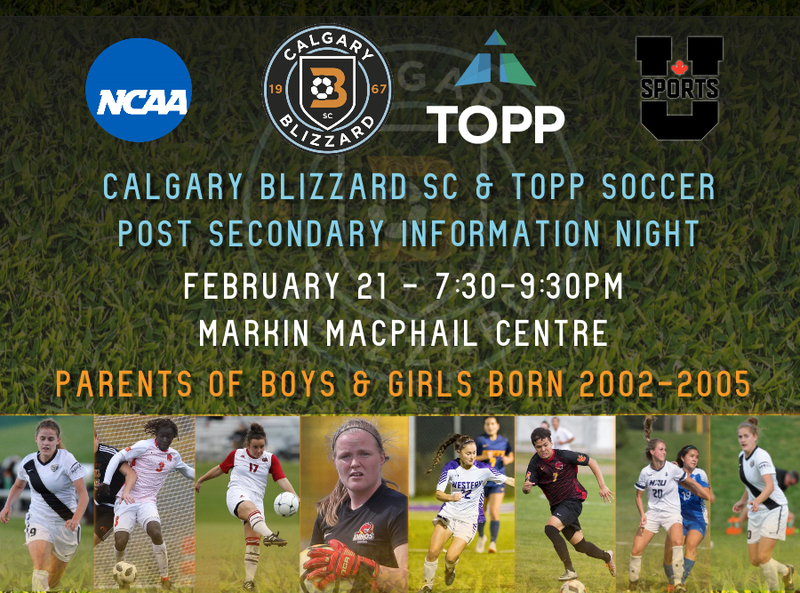 TOPP Soccer is an organization that is dedicated to helping elite male and female high school athletes have all the tools that they need to get to the university level and has chosen Calgary Blizzard as a TOPP Club Partner. TOPP has recently launched an online university recruitment portal that they are offering to select soccer clubs across Canada, and Blizzard has been chosen to be one of these clubs. These TOPP Club Partners have been identified as clubs developing players to the highest level in Canada, and serious about getting their players to the university level. TOPP is led by current and former NCAA and U Sport coaches and has identified Blizzard as an elite club fitting this criteria. Blizzard players will have the opportunity to be a part of a testing phase for the online recruiting portal. To RSVP, please register on PowerUp (Free of Cost) at the following link: https://calgaryblizzard.powerupsports.com/ Please also include the amount of attendees in you registration so we can plan accordingly (change quantity to two registrations if both parents/guardians will be in attendance).